The second deliverable from STAR work package 5 describes basic concepts and mathematical methods to evaluate potential effects of ionising radiation at chronic low dose rates on theoretical populations of ecologically representative non-human species. Protecting natural biota against ionising radiation requires that deleterious effects induced by increasing exposure dose rate are studied for a range of ecologically representative non-human species. These so-called dose rate-response relationships are quantified in laboratory conditions for effects such as molecular or cellular damages, reduction in survival, fecundity or hatching etc.. Protection levels are then defined based on the most radiosensitive endpoint in each species. However, wildlife species and natural ecosystems will be protected based on the durability of population growth rates. Therefore, the question which remains is how the different toxic effects described in laboratory tests (and their concomitant occurrence with increasing dose rate) affect population growth rate in a species. This deliverable explains how to combine dose rate-response relationships (established using radiation effect data available from the FREDERICA database) and evaluate their consequences for population growth rate, building population models known as “Leslie Matrices”. 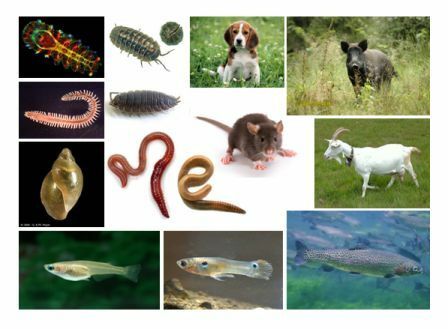 This exercise is achieved based on life history characteristics of each studied species for 14 different wildlife species (those having chronic effects of gamma radiation described in FREDERICA) covering 4 taxonomic groups including aquatic invertebrates (marine annelids Neanthes arenaceodentata and Ophryotrocha diademaand a freshwater gastropod Physa heterostropha), soil invertebrates (earthworms Eisenia fetida and Lumbricus terrestris and the common woodlouse Porcellio scaber), fish (the Japanese medaka Oryzias latipes, the guppy Poecilia reticulata and the rainbow trout Oncorhynchus mykiss) and terrestrial mammals (the mouse Mus musculus, the rat Rattus norvegicus, the dog Canis familiaris, the goat Capra hircus and the wild boar Sus scrofa). The state-of-the-art deliverable also includes a previously developed radiation effect model for fish and mammalian populations (the dual age class population model proposed by the IAEA EMRAS II working group 6). The photo illustrates the combination of radiation effects achieved to evaluate population consequences using Leslie matrices (F. ALONZO, IRSN).